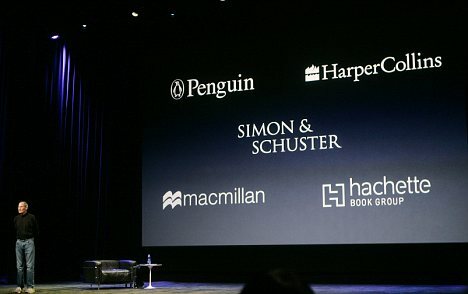 With backers like these (missing from this list of powerhouses is Random House), the iPad has already received enough support as a publishing platform to affect ebook pricing by important merchants such as Amazon. With the new iBook store, Apple hopes to influence ebooks like it did digital music with iTunes. To start, the iBook store includes 30,000 DRM-free Project Gutenberg titles. Apple also announced that all non-DRM ePub formats are iPad compatible. A major issue for libraries will be how the iPad works with subscription ebook services that use a DRM format (i.e. Overdrive and Netlibrary). iPhone users can currently access NetLibrary via their web browser. Therefore, the same should hold true for Netlibrary web access via the iPad. Another possibility would be for ebook services to make their content compatible with apps like the Iceberg Reader from ScrollMotion (note the Random House content). Additionally, libraries could take advantage of iPad apps from book sellers like Barnes & Nobles and Amazon. With these apps, the iPad is one of only a few ebook readers that can display ebooks purchased through these popular bookstores. if e-textbooks receive wide academic use, libraries will need to better accommodate this new information format. Seton Hill University has announced a program to give each student an iPad, which could significantly influence future textbook selections at this campus. Other publishers are looking to revolutionize periodicals, integrating multimedia and interactivity that is only possible on devices like the iPad. One exciting release is the Netflix app, which allows Netflix subscribers to stream video to the iPad. ABC also has an app that streams many of their popular TV shows directly to the iPad. However, a major complaint about the iPad is that it does not support Adobe Flash. This fact has forced several online video services, such as YouTube, to provide an iPad friendly version of their videos. However, iPad’s lack of Flash could cause major problems for libraries providing online access to video databases. Many of these databases rely on Flash to provide content, and unfortunately it is unlikely that academic databases will be as quick to respond to the iPad as YouTube was. So how does this help the library? The blog Gizmodo has a recent post about why the iPad is the future. The gist of the post is that the iPad’s simplicity makes it easy for anyone to learn. For libraries, the iPad could serve as a great low maintenance computer to be loaned out for casual use, freeing up desktop computers for more heavy duty work. Students looking to check Blackboard, email, or Facebook may choose to borrow an iPad over sitting at a desktop computer. Additionally, the iPad’s use of iTunes software makes adding and deleting content very easy. If anything goes wrong, iTunes can quickly restore your iPad to its default settings. This feature also provides librarians a fast and easy method for clearing the iPad after each loan. As a computer for librarians, the iPad will make a great roaming reference tool. The built in browser does a decent job displaying most library databases and catalogs. Most full-text content works with the iPad out of the box. I believe I can complete about 90% of my daily work on the iPad platform (with the addition of an iPad dock keyboard for lengthy typing). The iPad is also handy for catching up on all those articles you’ve been meaning to read. Instead of printing them, you can read them as PDFs on the iPad. Only time will tell the extent of the iPad’s influence, but it is undoubtedly an emerging technology worth library attention. Ken Fujiuchi is currently the Emerging Technology Librarian in the E.H. Butler Library at Buffalo State College. He has also worked as a lab and instructional facilities coordinator and adjunct faculty member in the School of Informatics at the University at Buffalo. Ken holds an Masters in Library Science from the University at Buffalo. His research interests include information literacy, information storage and retrieval, and human-computer interaction. You don’t have to be just a Libtechtalk groupie. Did you know that this blog is looking for guest authors? Contact ctomlinson at towson.edu to find out how you too can write about your favorite technologies and how they might be used in academic libraries. At first glance, Apple’s iPad really didn’t look like much. An expensive piece of glass that could be used as a paper weight as people were calling it a “gimped” version of a netbook. It lacks USB ports and HDMI outputs, has a closed operating system, lacks flash support. Many people bashed it for its shortcomings and nobody really knew which category of mobile computing it should fall into. It definitely lacks the horsepower to replace a laptop, it lacks the host of functions that netbooks have, it couldn’t replace tablets either because of its closed operating system. Despite its short comings, demand for the Apple’s product shattered expectations. The stronger-than-expected demand for the iPad in the United States took Apple by surprise. The several hundred thousand they released were not enough to cope with the demand for the United States alone. The shortage in the United States equated to a push back in the release date for iPads in the other markets around the world. A camera would be nice, but I am hoping that the ipad gets some better addons through hardware, similar to Camera for iPad ( http://itunes.apple.com/us/app/camera-for-ipad/id366129244?mt=8) that would allow the iPad to interact with other hardware. I’m sure it’s gonna be much more impressive in one or two years. It’s just the beginning of pads and Apple always find new ways to have a step further than their concurents.